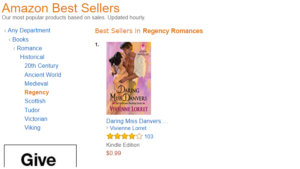 I woke up this morning to the best surprise – DARING MISS DANVERS hit #1 on Amazon (in Regency Romance)! To all the readers who invited Emma & Oliver into your hearts and e-readers, THANK YOU SO MUCH!! !